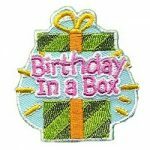 Donating birthday in a box for children in hospitals or families in need can help give a child a smile on their special day. 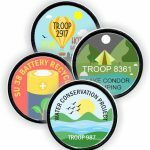 Your girls will remember their participation in your community service project with this colorful patch. Blessing bags typically contain sample sizes of hygene products that can help people through times of disaster. Your local Red Cross might have a list of items they would like included in kits they will accept as donations. Other items like a bottle of water can be added if you are distributing to the homeless. 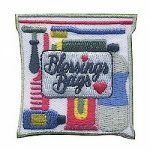 This patch from MakingFriends®.com will help your girls remember their service project. Book drives are a great service to your local shelter, community center, hospital and more. 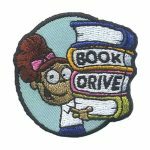 A Book Drive patch will remind your girls of their hard work. 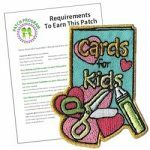 This colorful Cards for Kids patch is a great way for your Girls to remember their community service project by making cards for kids in the hospital or in shelters. 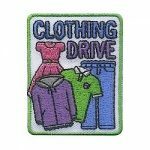 After your girls organize or participate in a clothing drive in your area, acknowledge their hard work by giving your girls a Clothing Drive service patch from MakingFriends®.com. Your girls can combine their love for crafts and passion for community service by creating items to donate. Bring your favorite craft projects when visiting seniors, veterans or shelters. This pretty patch is a reminder of the thoughtfulness of your girls. Wow! Make your own customized patches! 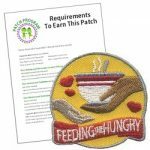 The Feeding the Hungry patch from MakingFriends®.com shows how much your Girls love helping others. Take a look at our free suggested requirements. 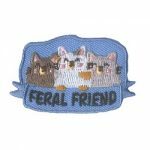 Girls who care about animals and nature will be proud to wear this Feral Friend patch after their community service project helping feral cats thrive.